Here at Christ Church with St. Philip there are groups and clubs to keep even the most active child busy, from activities for pre-school children to uniformed organisations and dance clubs. Our church offers a wide range of regular activities for children and young people – for more information, just click on the link, or see the A-Z list of groups in the table at the bottom of this page. 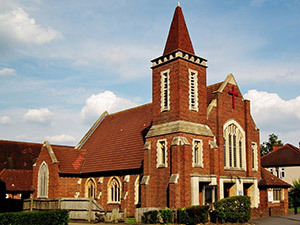 In addition to regular activities, the church runs a Summer Holiday Club for a week during the school summer holidays. This has a maximum capacity of 72 children aged from 5-11 and is always fully subscribed. Look at our Summer Holiday Club page to find out more. As well as church groups, there are a range of other activities for children and young people taking place in our halls each week. To find out more, take a look at the table at the bottom of the page. This provides an A-Z list of all the groups and organisations for children that meet at Christ Church with St. Philip, including the day and time the activity runs plus a named contact. Boys’ Brigade The Boys’ Brigade is a Christian youth organization for boys and young men aged 5-18. Wednesday 6.00-7.15pm (ages 5-7), 6.30-8.00pm (ages 8-10), and from 7.30pm (ages 11-18) For more information, contact David Pickett on 020 8641 0234 or visit their website www.thetenthbb.org. The GEE-FORCE School of Dance Dance school for children aged 3-16 run by a top theater/TV choreographer and dance coach with classes in Musical Theater to Hip Hop Saturday mornings with classes between 9am-1pm For more information, prices and term dates call 020 8401 2112 or email geeforcedance@hotmail.com or visit the GEE-FORCE Dance website. Girls’ Brigade The Girls’ Brigade is a Christian youth organization for girls and young women aged 5-18. Thursday 6.00-7.15pm (ages 5-8), 6.00-7.15pm (ages 8-11), 7.00-8.30pm (ages 11-13), and 7.15-8.45pm (ages 14+) For more information, contact Angela Perrins on 01344 621170. Girl Guiding – Rainbows Girl Guiding group for girls aged 5-7 years. Monday 5-6pm, Tuesday 4.30-5.30pm For more information, contact Christine Wicks on 020 8337 4010 or take a look at the Girl Guiding page on this website. If you wish to join, please register at www.girlguiding.org.uk/interested or phone 0800 1 69 59 01 as all registrations are now dealt with centrally. Girl Guiding – Brownies Girl Guiding group for girls aged 7-10 years. Monday 5.30-7.00pm, Tuesday 6.00-7.30pm For more information, contact Christine Wicks on 020 8337 4010 or take a look at the Girl Guiding page on this website. If you wish to join, please register at www.girlguiding.org.uk/interested or phone 0800 1 69 59 01 as all registrations are now dealt with centrally. Girl Guiding – Guides Girl Guiding group for girls aged 10-14 years. Monday 7.00-8.45pm For more information, contact Christine Wicks on 020 8337 4010 or take a look at the Girl Guiding page on this website. If you wish to join, please register at www.girlguiding.org.uk/interested or phone 0800 1 69 59 01 as all registrations are now dealt with centrally. Junior Music Group Group of young musicians, drawn mainly from the church congregation, but open to all. The group meets on Friday evenings and members take part in a mix of music, both modern and traditional, and drama, though it is primarily a music group. They accompany church services regularly and give concerts in aid of charity about three times a year. Friday 6.30-7.30pm For more information, contact Viv Newitt on 020 8337 9015 or take a look at this organisation’s own page on our website. Les Petits Pois French Club A French Club for babies 6 months+, toddlers and preschoolers to learn French through songs, nursery rhymes, little stories, games, arts and crafts. Thursday 9.15-10.00am (term-time only) For more information, contact Anne Le Romancer on 07779 122446 or anneleromancer@gmail.com. Little Kickers Football classes for children aged 18 months to 7 years. Tuesday 9.30-10.15am or 10.30-11.15am – exact time dependent on age of child For more information, contact Helen Kelly on 020 8286 6038 or hkelly@littlekickers.co.uk or visit the Little Kickers website. North Cheam Dance Academy Dance school with various classes including ballet, tap, modern and freestyle. Tuesday 3.45-9.00pm, Wednesday 2.00-3.00pm. For more information, contact Sarah Platt on 020 8395 8032 or visit their website. Parents and Toddlers Parent & Toddler group with a large selection of toys, plus craft activities and singing. Monday, Wednesday & Friday 9.30-11.00am Feel free to just come along or contact Christine Philpot on 020 8337 5122. Stephanie Florence Academy of Dance Dance school with various classes including ballet, tap, freestyle/street, acrobatics/gymnastics dance. Friday 4.00-6.15pm For more information, contact Stephanie Mavrommatis on 020 8641 5160 or visit their website. Summer Holiday Club Holiday club for children aged from 5-11. Usually the last week in August For more information, contact Christine Wicks on 020 8337 4010 or take a look at the holiday club page for more information. Toddling2Church Toddling2Church, Christ Church with St. Philip 2-3pm Parents, carers and pre-school children are all welcome to join us for songs with percussion instruments, a Bible story simply and sensitively told, a story-related craft activity and, of course, drinks and biscuits. Tuesday 2-3pm Feel free to just come along or contact Rev. Paul Timmis on 020 8337 2348. Also take a look at the Toddling2Church page for more information. Young Church Young Church uses stories, drama, craft work and games to help children and young people learn more about the Christian Faith. Each week is different and we have three different age groups – Busy Beans (crèche for ages 0-3), Buddies (ages 4-8) and The Hub (ages 8-14). Every Sunday 10 – 11/11.15am from September to July, except the first Sunday of each month when everyone joins together for our All Age Worship in church from 10-11am. Children meet in the church initially to share in the first part of the service, then go on to their own activities for the remainder of the time. Feel free to just come along or contact Annette Kempster on 020 8786 8339. Also take a look at the Young Church page for more detailed information.